Jet streams are relatively narrow bands of strong wind in the upper levels of the atmosphere. 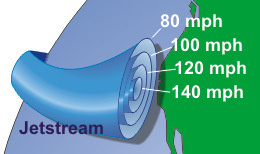 The winds blows from west to east in jet streams but the flow often shifts to the north and south. Jet streams follow the boundaries between hot and cold air. Since these hot and cold air boundaries are most pronounced in winter, jet streams are the strongest for both the northern and southern hemisphere winters. 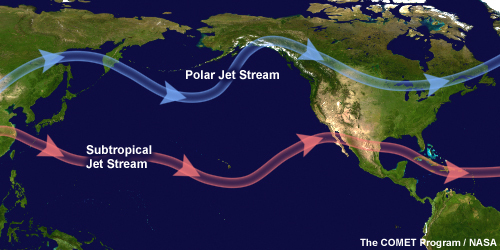 The actual appearance of jet streams result from the complex interaction between many variables - such as the location of high and low pressure systems, warm and cold air, and seasonal changes. They meander around the globe, dipping and rising in altitude/latitude, splitting at times and forming eddies, and even disappearing altogether to appear somewhere else. Jet streams also "follow the sun" in that as the sun's elevation increases each day in the spring, the jet streams shifts north moving into Canada by Summer. As Autumn approaches and the sun's elevation decreases, the jet stream moves south into the United States helping to bring cooler air to the country. 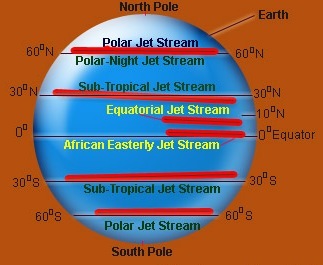 Also, the jet stream is often indicated by a line on maps and by television meteorologist. The line generally points to the location of the strongest wind. Jet streams are typically wider and not as distinct but a region where the wind increase toward a core of strongest wind. One way of visualizing this is consider a river. The river's current is generally the strongest in the center with decreasing strength as one approaches the river's bank. It can be said that jet streams are "rivers of air".